The "Original" listing of SoCal Launch Ramps on the web! Organized from North to South. If you know of a launch ramp that isn't here or have any other usefull information to share, please E-mail and I'll post it here. Tidelands Park - Morro Bay 2 $5 /day Yes, on Embarcadero (805) 772-6254 From Hwy. 1 take Morro Blvd. exit West. Turn left on Main, then right on Marina, then left on Embarcadero to the ramp. 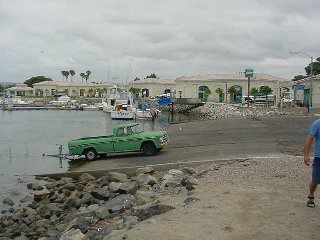 Santa Barbara Harbor 8 $4/launch $8/parking Yes (805) 564-5530 From Hwy. 101, take Castillo exit to Cabrillo Blvd. Turn right then take Harbor Way to the parking lot. Ventura Harbor 7 Day use free. O/N $5 Yes (805) 382-3007 From Hwy. 101, take Victoria exit South 7 miles to the ramp. Channel Islands Harbor 3 $5 Yes (805) 382-3007 Victoria Dr. South of Channel Islands Blvd. Marina Del Rey Harbor 8 $10 Yes (310) 305-9545 Located on Fiji Wy., South end of M.D.R. Cabrillo Beach Los Angeles 4 $15 No (310) 548-2645 From LA, take hwy 110 south to Gaffey St. turn left to 22nd St. turn left. Turn right on Pacific and then left on 37th St. follow to the ramp. South Shore Launch Ramp (Across from Queen Mary) 4 $10 Yes (562) 570-8636 590 Queensway Drive, Long Beach. Open 24hrs. Alamitos Bay Launch (Davies) 4 $12 Yes (562) 570-3215 From PCH, take 2nd street west to Marina drive, then right. Open 24 hours. Fire Station Ramp - Huntington Harbor 1 Metered Parking No N/A From PCH take Warner East, turn left at the Fire Station. $20 per day summer Yes (949) 729-3863 From PCH take Jamboree East, left to Newport Dunes Resort. Dana Point Harbor - Dana Point 7 $10 Yes (949) 496-6177 From I-5 exit PCH-Camino Las Ramblas. Turn Left on Dana Point Harbor Dr. and follow signs to the boat launch. Oceanside Harbor Launch - Oceanside 4 Free Yes (760) 435-4000 From I-5 take Oceanside Harbor Dr. West Left at the dead end and all the way around the harbor to the ramp. Additional parking through the tunnel behind the RR tracks. Santa Clara Point - Mission Bay 1 Free No (858) 490-0928 Off Mission Blvd. Vacation Isle. - Mission Bay 4 Free Yes N/A From I-5 take Sea World Dr. West to W. Mission Bay Dr. Keep veering right (loops around) to Ingrahm St. right at Vacation Isle. South Shore Ramp - Mission Bay 10 Free No (619) 221-8910 From I-5 take Sea World Dr. West to W. Right at South Shore Launch Ramp. Dana Launch Ramp - Mission Bay 4 Free No (619) 222-6440 From I-5 take Sea World Dr. West to W. Mission Bay Dr. Keep veering right (loops around). Turn right just past Dana Landing Hotel (before the Hyatt). De Anza Cove - Mission Bay 4 Free No N/A From I-5 S, take Balboa Ave exit turn right. Turn left at E. Mission Bay Dr. and then right at N. Mission Bay Dr. Follow signs to De Anza Pt. Shelter Island - San Diego 10 Free No (619) 686-6227 From I-5 take Rosecrans exit west. Turn left at Shelter Island Dr. Follow signs to ramp. Pepper Park - San Diego 10 Free No (619) 686-6200 From I-5 S, exit at Bay Marina Drive to Tidelands Ave. Road ends at ramp. Chula Vista Ramp - San Diego 10 Free No (619) 686-6227 From I-5 S, exit Marina Pkwy. St. Follow signs to the ramp. Hotel Coral - Ensenada 4 $38 (includes use of rec. facilities, showers, security parking, etc.) Yes (800) 862-9020 Take Mex. Hwy. 1 to just before the inland/coastal routes divider. Hotel Coral is on the right. Stay to the left on the long driveway to the left of the hotel.